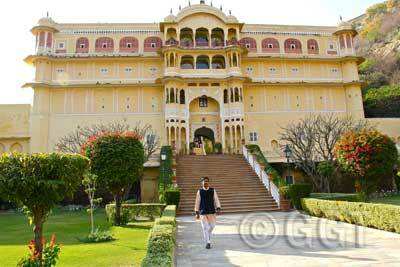 Samode Palace, Samode, Rajasthan (photo by Geringer Global Travel, India tour operator). In a region as historically rich and culturally distinctive as the Indian subcontinent, there are a wealth of unique accommodation options that are intimate, personal and–perhaps most of all–full of character. Colonial guesthouses. Boutique hotels. Elegant mansions, historic forts and grand palaces. These distinguished hotels in India and the subcontinent offer an experience unlike others: where you can tap into the history of the area and immerse yourself in the culture. Here are some particularly charming properties that will enhance your stay in this fascinating corner of the world. This intimate city hotel—converted from a large family home—teems with urban charm. A cheerful combination of European style and Indian flair, the hotel’s antique furniture and colorful decor create a welcoming environment. Whether you’re relaxing in your room (each is individually styled to be thoroughly distinct) or unwinding under the stars on the terrace, you’ll feel right at home at this chic city escape. A unique tented camp in the middle of the serene countryside, Chhattra Sagar was once an refuge for struggling farmers, who were invited to settle around the reservoir. Their descendants still live here, you can enjoy the unique experience of staying in luxury tents in this welcoming and distinctive environment. Breathe in the fresh air in this bucolic setting and, in the evening, sip cocktails as you bask in the glow of a Rajasthani sunset. Spend unforgettable days in this inviting homestay, where your host family will welcome you with the warmth for which Rajasthani people are known. In one of India’s most compelling regions, experience the simple charms of a family property, where you feel the culture of this area living as the chieftains of yore once did. Each room is spacious, delightfully decorated and separated from the main house for privacy. Built in the 1600s, this majestic structure looms mightily on a hill and offers a stunning view of the Aravalli mountain range and some picturesque lakes. Transformed from a fort into a hotel, this property bears all the hallmarks of Rajasthani character—including beautiful mirror work and murals—while also offering a warm and comfortable environment in which to relax and unwind. Just 80 miles from Udaipur, Deogarh Mahal is close enough to connect with the city while offering you the benefits of a rural escape. Just 40 minutes from uncommonly charming streets of Udaipur, this converted 18 th century fort’s contemporary interior belies its rich heritage. An intoxicating blend of old and new, Devi Garh offers well-decorated bedrooms and a unique, authentic environment that will add another layer of enjoyment to your India tour. One of the capital city’s finest hotels, the Imperial is a beautiful blend of colonial, art deco and Victorian styles. The hotel has maintained its majestic aura of elegance while also offering a thoroughly comfortable and well-appointed environment. Built in 1931, the heritage hotel’s superlative location in the heart of New Delhi makes it a perfect choice for your stay here. Nestled in the Himalayas, Itmenaan Estate is a tranquil, 10-acre mountain escape far away from the everyday. This property is surrounded by virgin pine, oak and rhododendron, and even offers its own private spring. In addition to panoramic views of the world’s most majestic mountain range, Itmenaan offers deluxe accommodations and superb service. This welcoming property is alluringly authentic: mud walls, charming alcoves and impeccably designed fireplaces make guests feel right at home. Of course, it is no surprise that this feels like such a real glimpse of Rajasthan: every person who worked on this lavish escape is from the region. Experience Indian hospitality in the middle of the Thar Desert at Mihir Garh. Welcome to Jodhpur’s first boutique hotel: an endearing property that exemplifies the charms of the Blue City. As you relax in one of the rooms—virtually all of which have a view of Mehrangarh Fort—embrace the feeling of juxtaposition here: old and new, traditional and modern… a true home thousands of miles from your own. Sandwiched between two of India’s most famous wildernesses—Keoladeo Ghana Bird Sanctuary in Bharatpur and Ranthambhore Tiger Reserve in Sawai Madhopur—this is an ideal launching point for your explorations of the area. Be coddled in comfort in between riveting rides through the wildlife-rich parks here, including Kailadevi National Park just a short drive away. Whether exploring the countryside, discovering the nearby lake or simply enjoying your charming accommodations, Ramathra Fort is an enchanting place to stay. This impressive hotel sits on the edge of the Thar Desert within the walls of Nagaur’s stunning Ahhichatragarh Fort, and it still bears much of the magnificence of its former incarnation. Formerly a home for royalty, the property’s 10 private havelis are nestled next to a spacious courtyard and pool area inside the fort’s walls—making travelers feel as if they are guests of the maharaja himself. Dripping with traditional charm, this Indo-Saracenic haveli has the ideal mix of modern luxuries, effusive warmth and a thoroughly Indian feel. Tucked away amid the bustling streets of old Jaipur, this intimate heritage hotel is a great way to combine the thrill of being in Jaipur with the quaintness and hospitality of a smaller property. Immerse yourself in contemporary luxury and distinctive personality of the Samode Palace, a 475-year-old property that radiates with history and charm. In addition to the exquisite architecture, you can expect superlative service and a magical overall experience at this truly regal hotel. Shahpura Bagh is located halfway between Jaipur and Udaipur, this modern hotel was once the summer residence of erstwhile rulers—today, it is an idyllic escape where you can relax and rejuvenate. In addition to offering luxury accommodations, the family is known for its warmth and hospitality. Revel in a luxurious setting at this charming camp and spa set on thirty acres in the Thar Desert. The Serai’s 21 large canvas tents are havens of comfort, and the amenities will have you feeling like royalty: an innovative pool inspired by a traditional Indian step-well, an endlessly indulgent spa designed by top spa company Raison d’Etre, and a dining tent and bar where you can enjoy delectable meals and libations in this singular setting. Brunton Boatyard is both a hotel and a tribute: the property is on the site of a 19 th century shipbuilding yard, and was created to reflect the spirit of those times. Each of the 22 en-suite rooms look out over the sea. Enjoy all the amenities of this celebrated hotel in the Cochin harbor: savor an exquisite meal at the History Restaurant, enjoy an after-dinner game of billiards, and later, sip a cocktail while looking out the water. Lying on 30 acres of lush foliage (some of which are given over to rice cultivation), the Coconut Lagoon is truly an eco-friendly escape. Each room is given a distinctive look and feel with locally made furniture and thoughtful décor. Enjoy the peaceful surroundings of this renowned resort in a number of ways: relax in the butterfly garden, take a dip in the plunge pool, canoe through backwater canals or enjoy a sunset cruise on the lake. Intertwined with the history of Cochin itself, the Malabar House’s history dates all the way back to 1755. It has been owned by everyone from tea traders to spice traders, and today it is Fort Cochin’s first boutique hotel. Every detail has been considered at this landmark destination, including the distinctive antiques and exquisite artwork. Tucked away in an isolated palm grove along the Arabian Sea, the Neeleshwar Hermitage is an eco–lodge that places a premium on luxury, privacy and tranquility. Stay at one of this resort’s 18 cottages, and enjoy the signature Indian hospitality as well as an Ayurvedic spa that offers yoga, meditation and massages. The building that houses the Old Harbour Hotel has been a centerpiece of Cochin history for 300 years; today, it is one of the historic city’s most exclusive addresses. Ideally located in the heart of ancient Fort Cochin, this Kerala boutique hotel maintains the heritage of this charming structure—the Dutch architectural style tinged with Portuguese influences—while providing an exquisitely comfortable environment in Old Cochin. When you stay at Philipkutty’s Farm, you’ll be warmly welcomed and looked after by your host family while also enjoying the privacy of your waterfront villa. You can also a cooking lesson, where you’ll learn the secrets of Kerala cuisine from the family matriarch. Enjoy an authentic Keralan experience in the company of this Indian family. This is where chic style meets backwater charm. The villas at Privacy are tantalizingly set on the palm-dotted shores of Lake Vembanad, and are superbly decorated with period furniture, striking artwork and bright fabrics. Just an hour and a half south of Cochin, this is an alluring getaway in south India. Looking out over the Blue Mountains of the Western Ghats, you’ll quickly understand that this property is aptly named. Serenity is a peaceful retreat conveniently located near Cochin as well as the Periyar Wildlife Reserve. This converted 1920s, 6-room house is nestled in a tropical atmosphere including papaya trees, pepper vines and a refreshing pool. Combining high-level comfort and service with a commitment to promoting authentic spiritual practice, Shreyas is among one of the finest yoga retreats in the world. This property is dedicated to the enriching spiritual tradition of treating each guest as an embodiment of the divine, in addition to being a paragon of practicing yoga. By blending the two—exquisite service and a connection with spiritual practice—Shreyas has developed sterling reputation with travelers from around the world. Hotel Duplex blends a Tamil spirit with French flair, and the result is a hotel worthy of the praise it receives from guests. Built for the erstwhile French mayor of Pondicherry, this heritage hotel has only 14 luxurious rooms, ensuring a level of intimacy and privacy that enhances any stay here. In addition to offering excellent service, the Duplex’s renowned Gourmet restaurant and Governor’s Lounge offer dishes and libations that are an epicurean’s delight. The thoughtful, authentic touches of the Hotel de L’Orient—savonnerie rugs and high-raftered ceilings, for a start—create a splendid setting in which to surrender yourself to the charm of this town. Originally built in the late 1760s, this deluxe India hotel with a touch of French personality. A distinctive heritage hotel, The Bungalow at the Beach is bookended by history—it is located between a 14 th-century Pandya temple and a 17 th-century Danish fort. In addition to enjoying sights like this from your verandah, you can enjoy the comfort and class of this hotel located in one of the most alluring parts of Tamil Nadu. Set in the Chettinad region—renowned for its grand temples and elaborate mansions—Visalam seems removed from the rest of the world. The 15 restored rooms here capture the heritage of this historic region. Enjoy being immersed in life here, enjoying everything from the delectable cuisine—for which Chettinad is famous—to learning little traditions like rangoli (the sprinkling of colored rice powder in kaleidoscopic patterns in the hallways), making flower garlands (otherwise known as poomalai), and learning the traditional Tamil board game Pallanguli. Visalam offers not only escape, but connection to this fascinating place. Looking out over the bathing ghats of the Narmada River, this quaint, family-owned property is a great stay while visiting this 4,000-year-old town. Explore the nearby attractions— including Mandu, Omkareshwar and Indore—or take advantage of the activities offered here, including taking a culinary lesson with the owner of the fort. Revel in the tranquility of Jehan Numba, a 19th century palace that is an intriguing blend of British Colonial, Italian Renaissance and Classical Greek architectural styles. This property, located in five acres verdant lawns with bursts of bougainvillea, has a grace and style that is enchanting and timeless. The 12 cottages at Reni Pani Jungle Lodge feature distinctive designs that are luxurious while still being respectful of—and connected with—the natural splendor of this wildlife-rich region. This conservation-minded lodge is located enticingly close to Satpura National Park and Tiger Reserve, and is situated on 30 acres with a waterhole, a sweeping meadow, a jungle pool and a cozy central meeting space (perfect for recounting the day’s adventures). Created with natural materials to resemble the architecture of nearby villages, Samode Safari Lodge is dedicated to providing a superlative safari experience while also being ecologically conscious. The lodge’s location close to Bandhavgarh National Park is perfect for exploring this world-famous wilderness, and the naturalists at Samode help to make your experience here unforgettable. Though auspiciously situated close to Khajuraho and Panna National Park, the Sarai Toria is a destination all on its own. This riverside retreat is luxurious yet eco-friendly; not only offering outstanding accommodations but serving as a base for conservation efforts and research into climate change. The lodge allows guests to experience the wildlife here while also playing a positive role in the economic and social development of the region. Set in an area of untamed beauty—Blackbuck is an excellent location from which to discover Velavadar Blackbuck National Park and the surrounding area. The lodge is spread out over 70 acres and offers a five-star experience (including world-class cuisine) in the heart of intoxicating wilds of Gujarat. This lodge is great for everything from quick getaways to elaborate family reunions. The setting is breathtaking—it is surrounded by lush gardens and ringed by the hills of Arpora, with views of the shimmering Arabian Sea—but that’s just part of the reason to visit Nilaya Hermitage. This is Goa’s leading boutique hotel, where you’ll be enveloped in comfort as you enjoy the elegance and exclusivity of an intimate, 20-acre escape. Grace and style seem to emanate from Burra Sahib’s Bungalow. Set on the Sangsua Tea Estate, the property’s architecture harkens back to the early 1900s and epitomizes hospitality and charm. The British colonial exterior, combined with the high-ceilings and verandahs with views of the colorful garden, help to make this four-bedroom guest house a great place to stay in Assam. A heavenly plantation retreat nestled in the rugged Kanchenjunga mountain range. Glenburn has been an institution in this region since the mid-19 th century. The estate is run by a pioneering tea-planting family, and allows you to stay in the heart of the tea industry: seeing just how the tea is grown and harvested, while also being cosseted in comfort (and perhaps enjoying a few cups of superb tea). An intimate escape that blends modern style with authentic Bhutanese character, Uma is in a prime location overlooking the picturesque Paro valley. In addition to offering 20 luxury rooms and 9 sumptuous suites, this deluxe hotel has a spa with two hot tubs and an indoor pool. Another of COMO’s luxurious hotels, the Uma in Punakha is set on a scenic bend on the Mo Chu River. The nine valley-view rooms and two villas each provide an elegant atmosphere in which to stay—and to immerse yourself in the charms of this postcard-perfect region of Bhutan. Experience the epitome of Nepali hospitality at Dwarika, a heritage hotel managed by Shrestha family. In addition to perusing one of the world’s largest collections of private woodwork—including some pieces from as far back as the 13 th century—you can enjoy your time in one of the 87 rooms and suites, which include organic linens and custom-made furniture. Located in the crisp alpine air more than 7,300 feet above sea level, Ceylon Tea Trails allows guests to observe life on an actual tea estate. Enjoy time in your authentic bungalow here (one of only four on the grounds) and take advantage of the activities and amenities: trekking, bike riding, gourmet meals and the service of your personal butler. Charming and authentic, this boutique hotel offers luxurious rooms, sumptuous cuisine, a refreshing pool and an overarching tranquility that will enhance your stay in Galle. It also is the ideal base for your discoveries of the area: from temples to beaches and picturesque tea plantations. Located on an 80-acre fruit estate close to Dambulla, this boutique hotel is built around providing guests with a sanctuary of peace and harmony. Luxury is found everywhere here, from the Egyptian cotton sheets to the delectable cuisine. Enjoy a refreshing dip in the pool, pamper yourself with a massage at the spa, and experience the serenity of Brook Boutique Hotel and Spa.